On the heels of the PaRappa The Rapper Remastered edition hitting PS4, the pump is primed for the next great, story-lead, rhythm action-adventure game. Who could do a better job than top rhythm action all-stars from NanaOn-Sha and iNiS J? Judging by the support pouring in for the Project Rap Rabbit Kickstarter, nobody. NanaOn-Sha, the company behind PaRappa The Rapper, is widely considered the creator of modern rhythm gaming. Meanwhile iNiS J are responsible for numerous rhythm classics like Gitaroo Man and Elite Beat Agents. Their leaders, Masaya Matsuura and Keiichi Yano have finally found an opportunity to work together, bringing to life their shared vision for the future of rhythm games. Not content to just rely on nostalgia, Matsuura-san and Yano-san began exploring ways to push the genre into new directions. They didn’t want to just revisit an existing series or retrofit an old system. To really move the genre forward, the developers felt a fresh start with a new IP was the best option. By creating Project Rap Rabbit they hope to explore innovative new input mechanics while simultaneously paying homage to the past. Drawing inspiration from traditional Japanese artwork and folklore, this new hip hop saga takes place in an alternate 16th century history. Our hero, rabbit farm boy, Toto-Maru must embrace the magic of rhythm and rhyme to bring about global unification and restore peace to the land. This is possible with his innate ability to harness the special power of force though rap. He is aided in his quest by Otama-Maru, his trusty frog sidekick. The premise may sound familiar, but the game’s mechanics have evolved far beyond the days of simply mastering button presses. Gone are the days of idly tapping along to linear song lyrics. 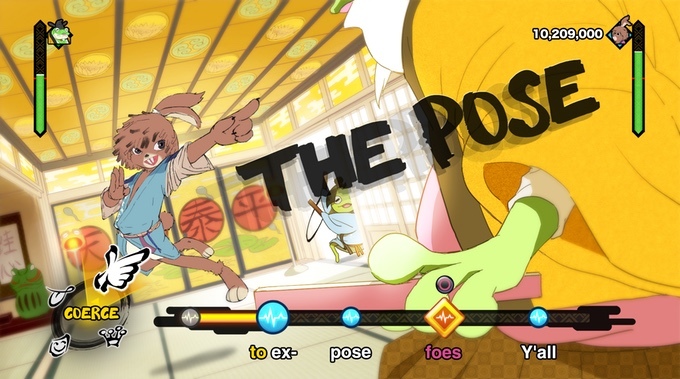 Project Rap Rabbit introduces an innovative new rap battle system. The new system puts players in control of their own rap destinies through flexible and dynamic dialogue trees. Battle segments are made up of multiple call and response steps where players must decide how to proceed. During the first step, players listen to their opponents attack and pick out keywords to utilize in their response. From there, players can select from four distinct “emotions” to frame their retort. Deciding when to boast, coerce, or hit back with a joke, impacts your adversary’s Swag Gauge. Once you’ve made your selections you’ll deliver your rap rebuttal by pressing specified buttons to properly enunciate your sick rhymes. This keeps your Swag Gauge high while inflicting damage to your opponents. It’s considerably more action than we’ve seen from previous rhythm titles. Backers are quickly pledging towards the team’s $1,102,921 funding goal. The devs have teamed up with publisher Pqube to help get all the pieces into place for an August 2018 release date. 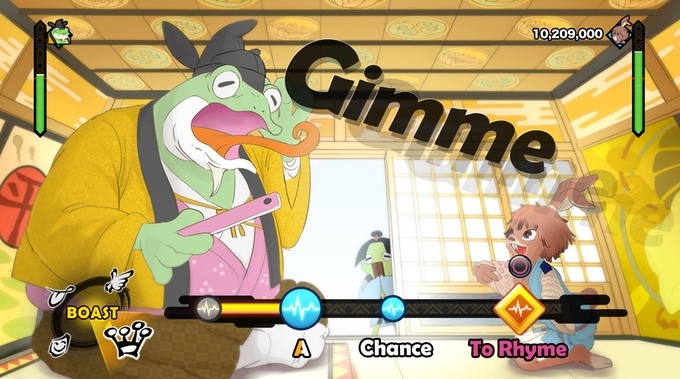 If everything goes according to plan, Project Rap Rabbit won’t just revitalize the rhythm genre, but take it to the next level for a whole new generation. Backers just gotta believe. Next articleIs Battletech’s Paradox Partnership a Harebrained Scheme?